during the NASCAR Xfinity Series Ford EcoBoost 300 at Homestead-Miami Speedway on November 17, 2018 in Homestead, Florida. Tyler Reddick claimed his second win of the 2018 NASCAR Xfinity Series season Saturday when he took the checkered flag in the Ford EcoBoost 300 series 2018 season-finale at Homestead-Miami Speedway. With the win came two season honors — Xfinity Series champion and Xfinity Series Rookie of the Year. Meanwhile, the No. 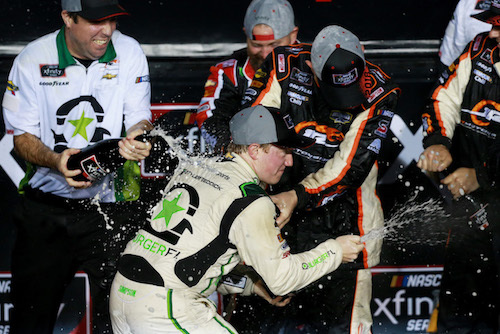 00 Stewart-Haas Racing team was crowned the 2018 Xfinity Series owners’ champion after its driver, Cole Custer, finished second to Reddick in Saturday’s race. Custer dominated the first half of the race, leading 95 of the 200 laps that made up the race, including the first 93 after starting from the pole. Custer lost the lead to John Hunter Nemechek on pit road after the second stage. 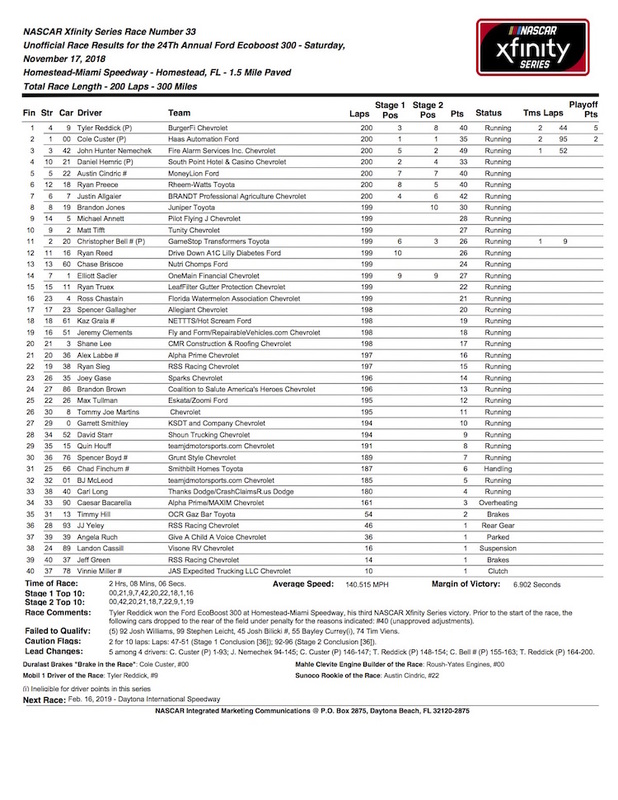 Reddick and Christopher Bell combined to lead the final 150 laps after a cycle of green-flag pit stops. Reddick took the lead for good on lap 164. Bell fell off the pace and made an unscheduled stop for a flag tire with 10 laps remaining. He wound up 11th at the checkered flag. Bell was the only championship contenders outside the top-five at the finish. The remaining title contender, Daniel Hemric, was fourth.